Kippenheim, 10 October 2017. New printing technology that creates a movement effect on packaging will attract the attention of consumers and achieve a sense of premium quality for products. Jaholo, a special micro-embossing printing technology, jointly developed by Janoschka and Amcor, produces prismatic and pattern movement effects which catch the eye. 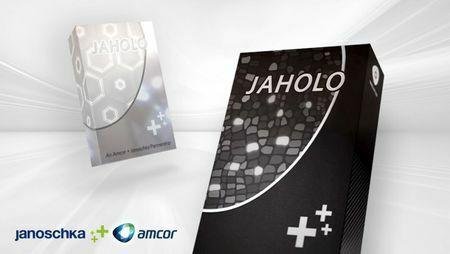 By combining Janoshka’s integrated prepress expertise with Amcor’s global printing and converting capabilities, the companies have industrialised Jaholo technology. Achieved through a special pre-press and inline gravure micro-embossing with UV, Jaholo integrates seamlessly with current designs and decoration features, including metallic effects. More than 30 generic Jaholo patterns have been successfully tested and custom designs can be developed through a barrel proof process. With design flexibility, Jaholo is suitable for geometric shapes, patterns, lines, text and logos, with any background colour. Jaholo complements current embossing, UV structures and other decorative effects and is compatible with various board types including SBS, FBB and laminated boards. Jaholo is supplied by Amcor from its two folding carton sites in Europe and Jaholo cylinders are produced at Janoschka’s engraving sites in Germany, Russia, Malaysia, Vietnam and Brazil. To meet growing demand, additional roll out to Amcor plants in Asia and the Americas is planned by the end of this year.